The regulation of non-geographic call services (NGCS) has rapidly evolved in the past few years, and often changes have been confusing for consumers and businesses alike. Just as you thought you had got to grips with the last revision, there is yet another change around the corner: Ofcom’s new call cost structure for service numbers starting 08, 09 and 118. In fairness, if consumers were lacking confidence in using service numbers in the past, you couldn’t blame them. Confusion about the pricing for 08, 09 and 118 calls was great, Ofcom research had previously shown, especially as callers to service numbers typically were not told explicitly by their telephone company or service providers how much they would be charged per call. Now this is about to change. From 1st July 2015, Ofcom’s new policy on non-geographic service numbers will finally do away with the puzzlement for all consumers with mobile and landline phones in the UK. Under the regulator’s new rules, consumers will see call cost split into an access charge that is fixed by their phone company and a service charge specified by the company or organisation they are calling – in other words, yourself. Access charges will be set individually by phone companies and communicated to consumers upon contract signing and on their phone bills. By contrast, your business as a service provider will be responsible for stating relevant service charges clearly wherever you publish or advertise the service number(s) you use – think broadcast advertising, print & online advertising, bill boards and posters, PR material, POS displays, packaging, website, service directories and similar. In short, virtually any place your NGCS number appears you will need to make sure to display the exact service charge applicable. This way, your customers will be in a position to add together access and service charges to easily work out call charges from landlines and mobile phones before making a call. If this helps to build confidence in your service number(s) and means that you have an opportunity to deliver great customer service via the phone, then everyone’s a winner! # Contact your 08, 09 or 118 telephone number provider to establish the service charge banding for your non-geographic number(s) and be clear about the cost you will be required to communicate to your customers. # Decide if the service charge is suitable. If you’re in need of a different service charge banding, you may want to consider changing your telephone number(s). # Update your marketing and advertising collateral. The new policy requires all organisations with non-geographic service numbers to include the service charge information in a prominent position and in close proximity to the telephone number in all marketing collateral and business communications. Beware, the Advertising Standards Agency (ASA) and PhonepayPlus will be responsible for enforcing the requirements for including service charge information in advertising. # State your service charge clearly & simply. Ofcom suggests that your service charge note could read “Calls will cost 5p per minute plus your telephone company’s access charge.” This simple wording should rule out any misunderstanding as to what your customers will be charged. To be on the safe side, though, check with the Advertising Standards Authority (ASA) on how to word and layout your service charge advice. If you are unsure about the service charge rates that apply to your non-geographic numbers, don’t hesitate to get in touch with your NGCS number supplier and request a table showing the service charge banding for each number group. Bear in mind that the bandings cannot be altered, i.e. if you were in need of a higher or lower service charge rate for any reason you would need to change the NGCS number range you are using. 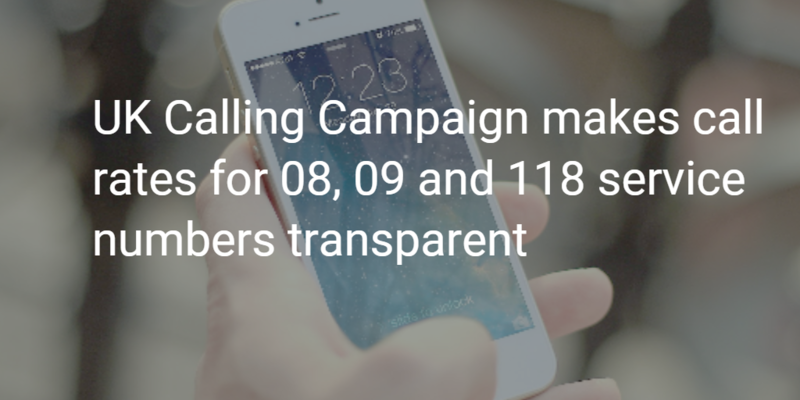 In another change, calls to 080 and 116 numbers which are already free from consumer landlines will become free to call from mobile phones, too. This change will enable organisations on these ranges to advertise a clear message to consumers that these numbers are always free. Again, this change should encourage the demand for service and improve consumer understanding of the ranges, which will particularly empower vulnerable consumers to access important services through 080 and 116 numbers. It also means that the called party operating the freephone number will have to pick up the costs of those calls, paying the origination cost from a mobile. While the benefits to consumers and service providers are anticipated to outweigh these costs, it is possible to move your services away from a freephone range onto another non-geographic or geographic range. For more information on the biggest call charge change in a decade, take a look at www.ukcalling.info.